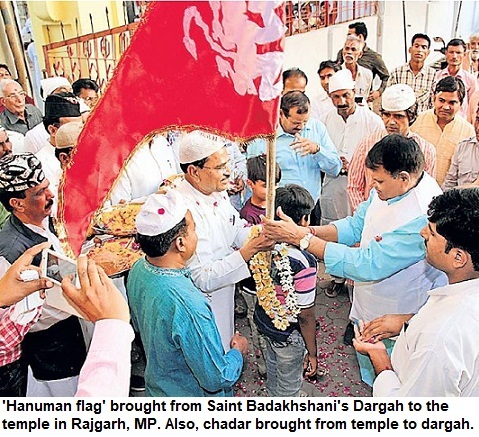 Indscribe's Blog: News and Views about Indian Muslims: Who should be blamed for the plight of Palestinians: Arab states or Israel? Who should be blamed for the plight of Palestinians: Arab states or Israel? 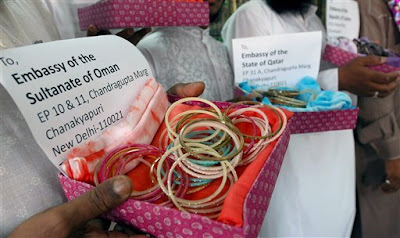 The photograph shows boxes of bangles that are sent to various Arab countries to shame their governments for their inaction* and deliver the message that they are useless cowards. But in Indian and South Asian tradition bangles are historically sent to a person who has shown cowardice like running away from battlefield. It was meant an insult on the person and often this prompted him to act and be a man (sic). But the Mumbai protesters who are sending these boxes through embassies of these countries, perhaps knew of no other way to send their message across. *Action doesn't mean war, it can be buying peace or making peace or anything that can stop senseless killing. And Arab states seem incapable of anything. I am avoiding watching TV and reading news about Gaza. It isn't that I am not disturbed by the Israeli offensive on Palestine and the sheer brutality of the attack that has now killed near 500 persons including women and children, mostly civilians during the last week. I'm as shaken as I am whenever there is a humanitarian tragedy, whenever innocents get killed, irrespective of their country or religion. It is the most heart-rending sight on earth to see children, as small as few months old, lying in the hospital beds, and to see the faces of infants disfigured in the air-strikes and bombings. But who should we blame? And what purpose will it serve? International community keeps condemning Israel and there are protests but there is no effort on part of the Arab states to take any concrete steps to put to end the misery of the Palestinians. After every such round of bombings, the jokers [OIC and representatives of Arab states] rush for 'emergency meetings' and devise strategies to stop the Israeli aggression but end up issuing useless statements. The fact is that Arab countries are not serious and not concerned. Let alone rulers, even the citizens don't appear concerned. We see the mass protests in East Asia, Europe and South Asia but the Arab street remains silent. People claim that they can't hold protests in their countries. If there is real anger on the street, the government, howsoever stubborn it may be, does succumb. There are military ruled countries where protests are held because the citizens are motivated. When ordinary Palestinians give their lives, some Arab citizens should also be ready to pay the price. Why we don't see any Aung Sun Suu Kyi or Nelson Mandela rise in Middle-East ? The dictatorial regimes are simply interested their own survival. The rulers love America for letting them run their countries like medieval states. Women don't have equal rights, there is no right to freedom of speech and criticism of the governments is unimaginable. Protests and demonstrations are unheard of. The non-Arabs are not treated at par. Yes, the oil-rich states have given jobs to tens of thousands but it might have been the same situation had there been democratic regimes. Many Arab countries have accepted Israel and have diplomatic relations while some of them don't openly accept but have secret links with the Jewish state. No harm in that. It is better to have open relations than hypocrisy. The Arab states are not just useless because they have neither proper words nor action to take when a country like Iraq is attacked or when Israel strikes in Gaza. But they are really pathetic because when there was a genocide in Bosnia, it was USA that acted. There are cycles of violence and hate. Arabs can't fight Israel. So they better accept the reality. Yes, Palestinians may not in near future forgive Israel but Arab countries can together make some sort of peace and force Israel to stop this bloodshed. They should stop using the name of Islam and it's time to dissolve the OIC. One should feel angry for injustice and for killing of innocents. If these states claim that they are angry because the bombings are on fellow Arabs or fellow Muslims, it is an extreme narrow vision (though this also doesn't prompt them to act and exposes them further). It should be pure humanitarian cause. But we are not living in a Utopian world where everybody fights for justice of the other. The people of Gaza have been living in a virtual hell, a prison, for a long time and the governments think over 'opening borders' now. Pay the price whatever it is but stop the killings of innocent citizens. But the so-called monarchs and the heads of other so-called Muslim leaders have no interest in either Islam or justice. Islam! Huh! If it was Islam, they wouldn't have changed the name of Prophet's Arab, the Hijaz, to Saudi Arabia. Today it is Saudi Arabia, named after the Family of Saud. The bunch of so many Arab states has no bargaining power, no voice. Pathetic. But who are we and our voice? Watching and reading about killings of innocents makes you upset. You can't make a difference either. So isn't it better to shut off from all. So mean but there is no option, I guess.